We have been having some extreme weather lately. 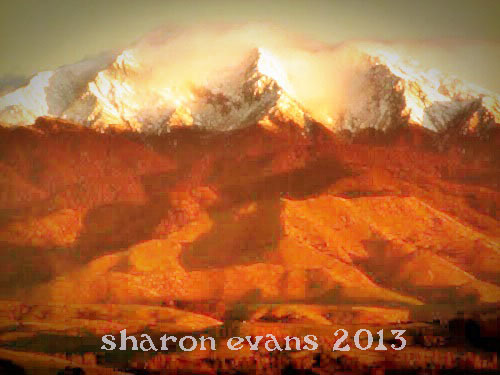 The ranges behind our small town are covered in snow, usually you can’t see them as they are covered in cloud. 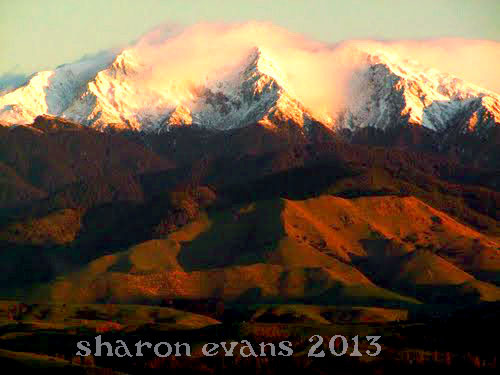 But this weekend the sunrise was doing its work and this was the view as I walked to the diary to get some milk. Then I fiddled with the photo in levels etc. Then I went into full play mode and created this. I know I used a background from Shadowhouse Creations and lots of filters and created a mirror effect to give the impression of reflections in water. 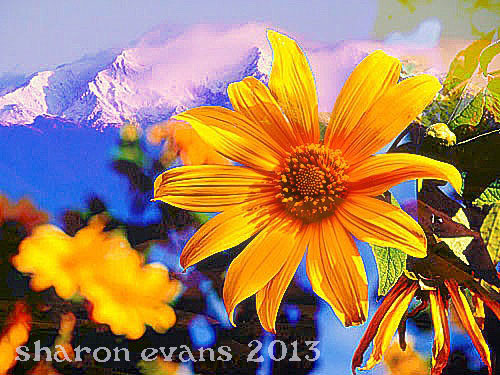 Then I went back to the original and superimposed a photo of some Mexican sunflowers that were growing in my garden in the summer. With all this cold I need a little sunshine! 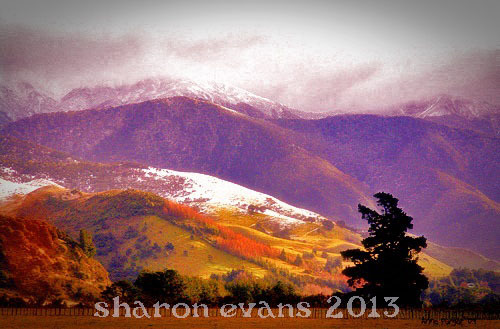 Then I used another photo of the Tararuas further up the valley, the snow had come down to the foothills. I admit that I enhanced the sunlit areas in photoshop. Wow these are fantastic! And you live in such a beautiful place. Weather has been strange up here in northern Europe too. 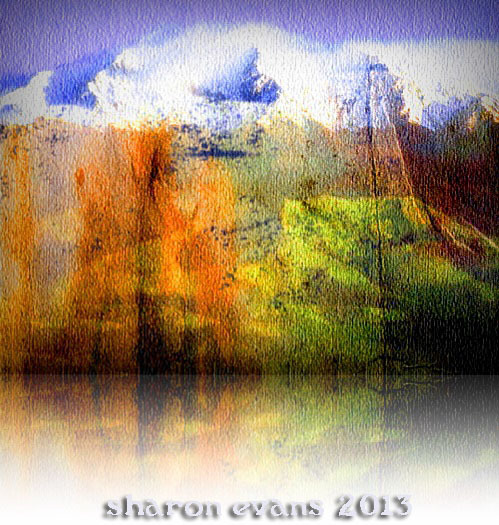 Sharon these are beautiful. Each one is different yet lovely. What a wonderful way to start the day. Have a great week. What a stunning view you have there. To have such an inspiration in your backyard, wonderful. 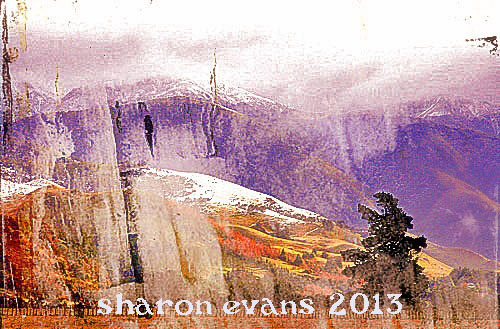 I like how you transformed your photo's, the look wonderful. Beautiful pictures with wonderful editing of colours. Lovely images! The effects you get are so pretty and they have a wonderful visual texture. just amazing..AND even the original..love love love..snow on the hills and the mystery cloud above...what a magical place to live! Beautiful mountains. How wonderful walking to the dairy to get milk. It's been ages since last I did that. We don't have dairy's out this way anymore. It's sad. Great photos. I'll be joining in soon. Have to get out there and take pix. What a view :-) the original is my favorite! But I love how you used the different filters to change the expression/impression, the "water color papery" effect on the third is pretty cool.